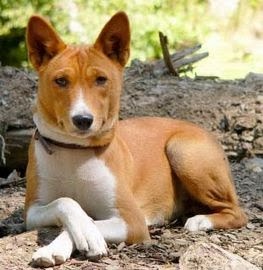 The Telomian is a rare dog breed native to Malaysia. Historically, they have filled an important task in their home country; their owners used to live in huts only reached by ladder, and the dogs needed to be able to climb and kill any rats and snakes that might enter the homes. Besides climbing and hunting on land they are also skilled at fishing from nearby streams. The first Telomian entered the US in 1963 and they have been bred here ever since, but gained little interest. They're not currently recognized by any major kennel clubs in the USA. Telomians are alert and make great watch dogs. Their short coat requires little care and they get by on moderate exercise. They're known for being intelligent, alert, and obedient, and they can use their paws to hold toys and open doors. Fun fact: the Telomian has a blue tongue. Happy Halloween - do you dress up your pets? Do you know someone who looks like their dog? Why are cats so attracted to boxes? Make sweet potato dog biscuits; quick and easy! Photo contest: win 1,000 lbs of dog food! Can a dog eat fruits and berries?